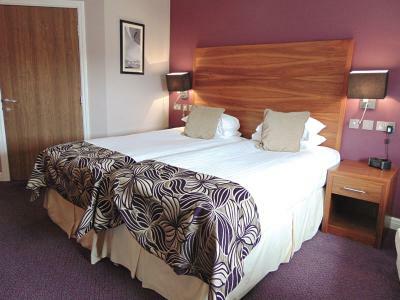 Blackpool FC Hotel is conveniently placed between the town centre and Blackpool Pleasure Beach. 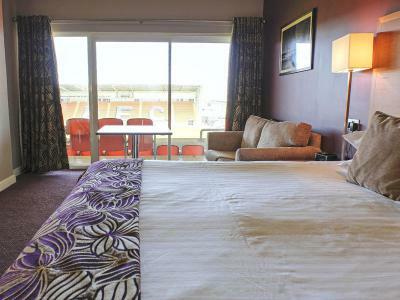 It offers stylish accommodation, including unique pitch-view bedrooms that directly overlook the Blackpool FC stadium. It also features the ‘Best New Restaurant North West 2012-13’ and its own fitness centre. Contemporary style en suite bedroom, 256 sqf, offering free Wi-Fi, air-conditioning, 40” digital TV/radio, media hub docking station, writing desk, direct dial telephone, internet connection point, alarm clock, ironing station, tea and coffee making facilities, bathrobes, Duck Island toiletries, hairdryer, and key card access. King-size bed. Town view. Contemporary style en suite bedroom, 256 sqf, offering free Wi-Fi, air-conditioning, 40” digital TV/radio, media hub docking station, writing desk, direct dial telephone, internet connection point, alarm clock, ironing station, tea and coffee making facilities, bathrobes, Duck Island toiletries, hairdryer, and key card access. Two single beds. Town view. Contemporary style en suite bedroom, 425 sqf, offering free Wi-Fi, air-conditioning, 40” digital TV/radio, media hub docking station, writing desk, direct dial telephone, internet connection point, alarm clock, ironing station, tea and coffee making facilities, bathrobes, Duck Island toiletries, hairdryer, and key card access. King-size bed and sofa bed. 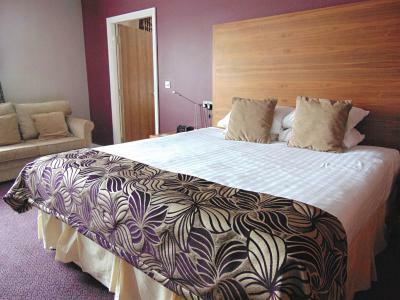 Can accommodate up to 2 adults and 2 children (12 years and under). Pitch view. Contemporary style en suite bedroom, 425 sqf, offering free Wi-Fi, air-conditioning, 40” digital TV/radio, media hub docking station, writing desk, direct dial telephone, internet connection point, alarm clock, ironing station, tea and coffee making facilities, bathrobes, Duck Island toiletries, hairdryer, and key card access. 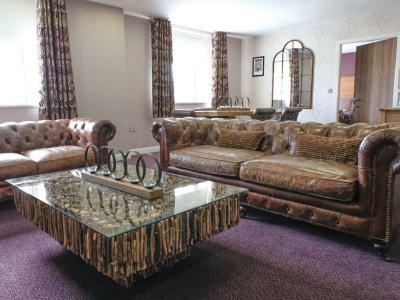 Two single beds and sofa bed. 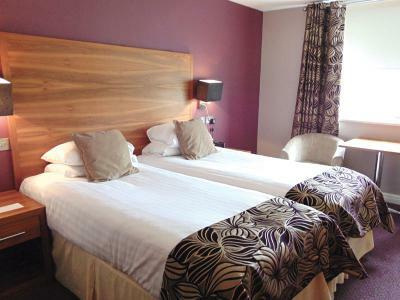 Can accommodate up to 2 adults and 2 children (12 years and under). Pitch view. 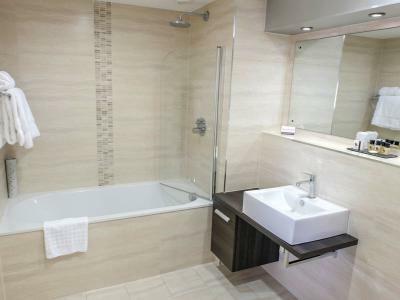 Contemporary style suite, 885 sqf, offering free Wi-Fi, air-conditioning, 40” digital TV/radio, media hub docking station, writing desk, direct dial telephone, internet connection point, alarm clock, ironing station, tea and coffee making facilities, bathrobes, Duck Island toiletries, hairdryer, and key card access. 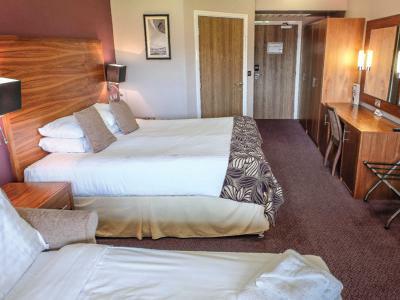 The Bloomfield Suite has a master bedroom, a separate lounge area, an en suite bathroom with separate bath and walk-in shower, and an en suite twin room with interlocking doors. King-size bed. Head west on the M55 towards exit 3. Continue onto the A5230. At the roundabout, take the second exit onto Yeadon Way. Continue on Yeadon Way. At the second roundabout, take the second exit onto Seasiders Way. Blackpool FC is on your right-hand side. At the traffic lights immediately in front of the stadium, turn right and the hotel entrance is 200 yards on your left. Head west on Squires Gate Lane/A5230 toward Lytham Road/B5262. Turn right onto Lytham Road. Continue straight on through one roundabout. After 500 metres, turn right onto Bloomfield Road. Take the second left onto Seasiders Way. Blackpool FC is on your right-hand side. At the traffic lights immediately in front of the stadium, turn right and the hotel entrance is 200 yards on your left. Winner of 'Best New Restaurant North West 2012/13,' as voted by Lancashire Magazine readers, Rowley's enjoys stadium views and features a modern British menu: slice into a succulent 10oz sirloin steak or relish an all-time favourite like Rowley's Big Game Duck - prepared from locally sourced, seasonal ingredients and bursting with big flavours. 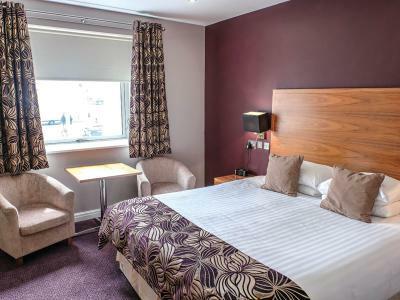 Blackpool FC Hotel's stylish sports bar is an ideal place to meet up for a bar snack or light bite and to catch up on all the latest on Sky Sports, ESPN and more with TVs positioned around the bar. Open on match days only. 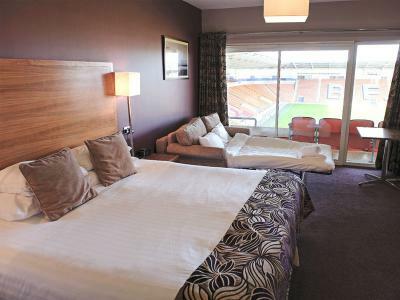 Blackpool FC Hotel offers guests the opportunity to work up a sweat and to build up an appetite without leaving the hotel. Open all week, the fitness centre comprises 20 cardiovascular machines and 15 resistance machines, as well as a free weights suite, a spinning studio and a fitness studio.